Renaza reclaimed hardwood timber wall tiles are versatile; our vibrant wood panels can be found highlighting residential living areas including Media walls, partitions, kitchen bench faces, entrance hallways and bathrooms. When it comes to commercial spaces – Renaza cladding expresses itself in coffee shops, bars, clubs, restaurants, wine cellars, boardrooms, foyers, hotels and architectural service environments. Renaza works anywhere where creating a sophisticated ‘wow factor’ impact is required. Renaza features 2 distinct product ranges, Rustico and Silva. 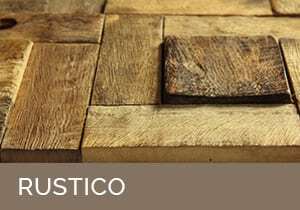 Rustico by Renaza is naturally finished timber mosaic hardwood timber wall tile. The overall panel dynamic is perfect for provincial and relaxed interiors where a sense of a connection with nature is paramount. This cladding requires minimal tooling and finishing allows the honest spirit of the timber to shine through, creating a soothing and organic feel to the decorated space. Rustico by Renaza creates a stunning decor impact expressed by beautiful recycled hardwood. Silva by Renaza is a mosaic wall tile characterised by a polished, understated elegance, perfect for creating subtle textures in office interiors or lifestyle venues. Allowing the beauty of the hardwood timber grain to speak for itself, this range lends itself to almost any feature panel application. 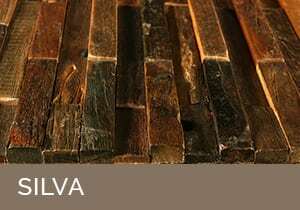 With a refined finish to each of its sleek mosaic pieces, Silva is a popular cladding choice to complement designer spaces.